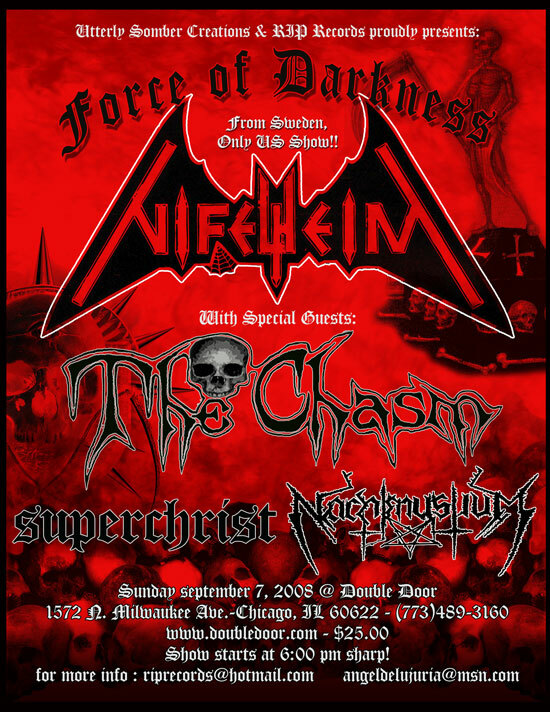 The next stage of Nachtmystium`s seemingly worldwide takeover supporting their newest output - Assassins: Black Meddle Part I - the Chicagoan stormtroopers will be playing alongside Sweden`s almighty kings of Satanic black-thrash Nifelhiem, on a one-time American appearance at Chicago`s Double Door on September 7. Judd adds: "Having been Nifelheim fans for over ten years, this is quite the honor for us." As previously announced, Nachtmystium`s run with Opeth and High on Fire through North America goes from mid-September into the first week of October. Soon after that a smaller US tour with friends Wolves In the Throne Room is coming together with several dates confirmed and more in the works. The band have also been confirmed to join Cathedral, Electric Wizard, Grand Magus, Rwake, Witchcraft, and tons of the doom and stoner world`s elite this November at Norway`s Gunfest. It`s shaping up to be a busy autumn" Judd adds. "We hope to see all of our supporters on the road!"